This simple technique can be adapted to make latex bladders for any situation. The steps involved in the process were originally developed for the construction of a spurting blood razor for the Opera Australia production of “Sweeney Todd”. 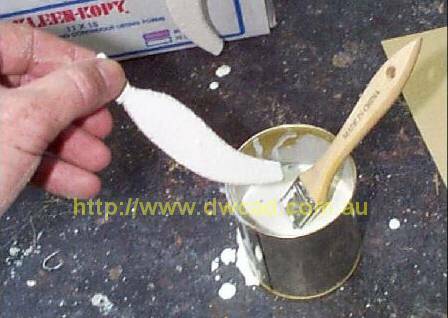 The following steps illustrate the principle of making latex bladders for a specific purpose. They can be varies as dictated by circumstances. The original CAD drawings of the razor were used to produce DXF files and the razor part were laser cut in aluminium. When the parts were assembled the handle had a hollow recess into which a clear Perspex trigger handle could slide. 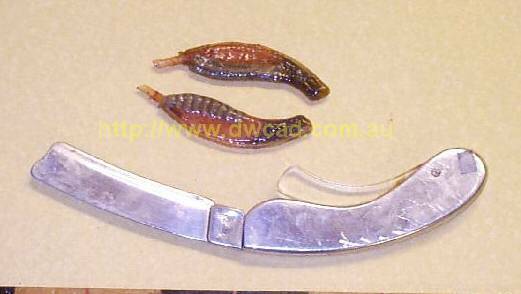 Squeezing the trigger handle into the body of the razor compressed the blood filled bladder inside making the blood squirt out from the base of the blade. The first step in making a bladder for the razor is to mark out the bladder shape on some 5-7mm thick polystyrene using a template based on the shape of the recess in the razor handle. 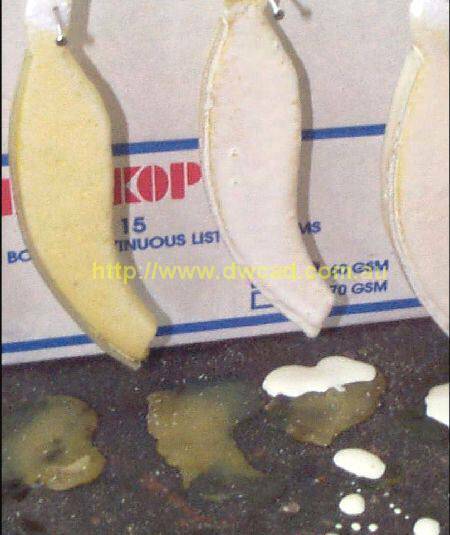 Cut out the shape with a band saw or very sharp knife. Smooth the polystyrene form by gently rubbing it on sandpaper to get rid of any roughness on it’s surface and make it ~2mm smaller than the finished size. Slightly round the edges so that there are no sharp right angles. This stops the latex thinning on the edge when its applied. Latex rubber in now painted onto the polystyrene form. Ensure good even adhesion on this first coat. Also make sure all the edges are covered. Pin up and allow to dry. A small fan or heat gun can be directed at the latex to speed up the drying time. Repeat this process X4 times to ensure a sealed skin around the polystyrene form. You will need to remove any latex pooling at the bottom of the bladder due to gravity as its drying. 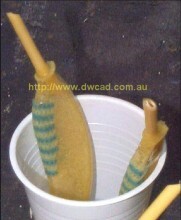 This needs to be dabbed after each application to prevent an excessive build up of latex at the bottom of the bladder. An acrylic strip is now cut to fit along the back of the bladder. This strip is going to be used to give the bladder some rigidity so it can be easily inserted into the razor handle. If it didn’t have this strip the bladder would distort when pressure was applied and the contents would go everywhere! 1mm thick clear acrylic strip is used and is cut to size on a guillotine but a strong pair of scissors will suffice. 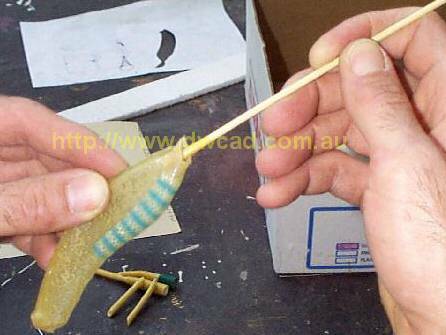 The acrylic strips are heated gently with a heat gun to bend them to the curve of the back of the bladders. Wear good leather gloves doing this as it gets VERY hot. When that is done the acrylic strip is glued to the back edge of the bladder using contact glue. Make sure there is a good bond with the bladder. Leave this to dry thoroughly before the next step which is to seal the acrylic strip into the bladder with more coats of latex rubber. Apply another X3 layers of latex to the bladder to seal the acrylic strip into the bladder. Make sure the latex gets into the little gaps between the strip and the bladder. Finally a piece of kitchen wipe reinforcement is added to one side of the bladder with latex. This gives a bit of added strength to the bladder at the point where the trigger handle contacts to make the blood squirt out. Now comes a neat trick! Get a shallow bowl and fill it with acetone. Make sure there is no naked flame around as it’s extremely flammable. 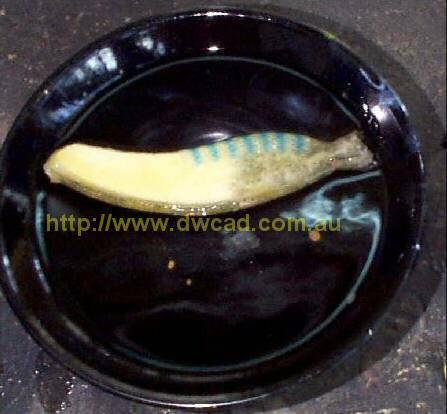 The bladder is put into the bowl of acetone which dissolves the polystyrene core away leaving an empty latex bladder. Completely dry out the inside of the bladder by blowing in air through a straw. Next we need to attach a tube to the end of the bladder. The best thing is to buy a catheter and cut off a bit of its latex tubing. Cut the tubing at an angle rather than a straight cut because it makes it easier for the blood to be squeezed through. Trim the end of the bladder and apply contact glue to the inside being careful not to glue the hole shut. You will ruin the bladder trying to open it up again. 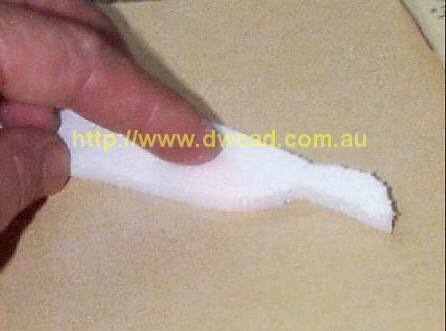 Contact glue is also applied to the latex catheter tube. When just about touch dry it is inserted about 10-12mm into the top of the bladder. In order to get it in that far without sticking to the first bit of contact glue it touches it’s necessary to put the glued end of the latex tube inside a piece of drinking straw. The straw (with the latex tube inside) is slid into the top of the bladder and, when in the right position, the straw is slipped back up the latex tube exposing it to the full 10-12mm contact glued section inside the bladder. Squeeze to ensure good adhesion. Leave it to dry overnight. Finally apply more latex around the tube entry point to build up a latex skin between the tube and the bladder body which helps make a good seal. Repeat this process X3 times, waiting for each application to dry completely before applying the next. Now the bladder can be filled with blood using a hypodermic syringe and inserted into the razor handle. Apply some water based lubricant to the razor recess and on the bladder. This makes it easy for the trigger handle to compress the bladder. This entry was posted in Prop Making and tagged props, techniques. Bookmark the permalink.